It starts with a dog...and ends with clean parks! 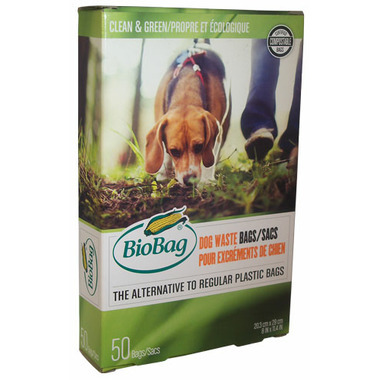 BioBag Dog-Waste Bags do not contain any polyethylene-based ingredients. They are as natural as dog waste and decompose within 40 days in a well-functioning composting environment. By comparison, it takes more than 100 years for normal plastic bags to decompose. Why use polyethylene bags to pick up your dog waste (which is 100% Biodegradable) and then ends up in a landfill that will remain with us for 100 years or more? The logical solution is to use BioBag Dog Waste Bags, which are 100% Biodegradable. BioBag Dog is certified according to the European Standard EN13432 for compostable products and the US Standard ASTM D6400 for compostable plastics. On behalf of the environment - Thank you ! I have been using these certified by BPI compostable dog waste bags for years and they have never had holes. Pet waste can go in compost bins where permitted. I am very pleased with the quality of these bags. The texture is superior to plastic and best of all, compostable! Much better than so-called 'biodegradable' bags. Good product, I like that they have little.holes so youre able to hang them. They rip off easy, durable material. Can pick up multiple dog poops in one go without worrying about wearing the poop. I love that I can compost dog waste and avoid throwing out all of that plastic. I deducted one star because the cost is quadruple or more the price of plastic waste bags, and I wish they came in boxes larger than 50.